For our October Knitting retreat we made these sweet rag dolls. They're knit in the round, starting with the legs, which are joined with a knitted gusset to create the basis for a body, which is then knit up to the head. 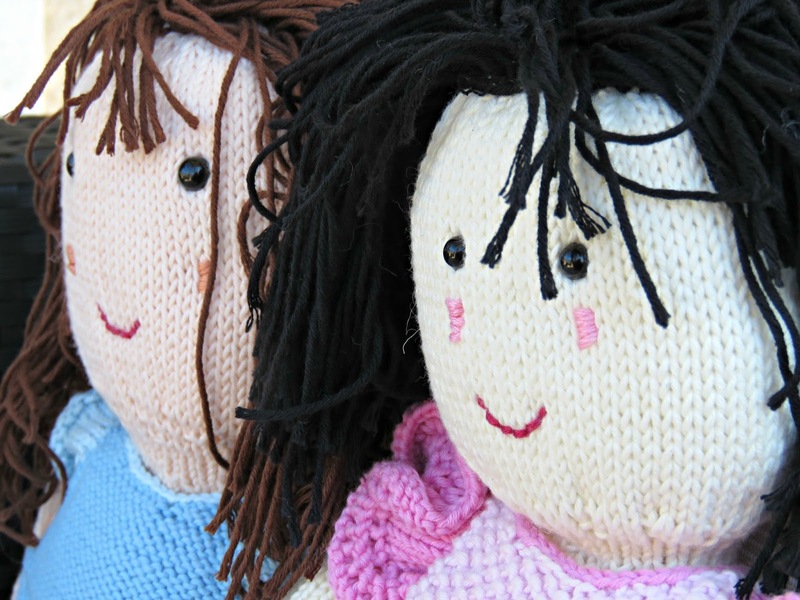 They're a great way to use up scraps of 4 ply wool left over from other projects. 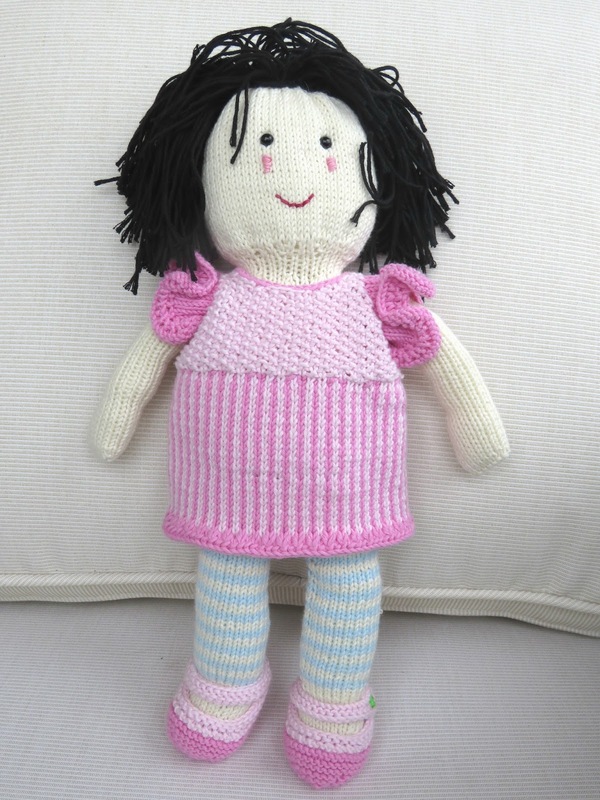 We used our own-label, Costa Brava Knitting 100% organic cotton yarn. 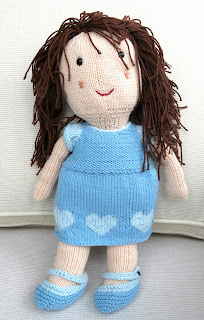 You'll need one 50 g ball of the skin-coloured yarn to knit the body of the doll and scraps for her shoes, dress and hair. M1 = make a new stitch by bringing yarn to the front (yarn forward YFWD) and knitting the next stitch. This will create a new stitch to be worked on the next row. YFWD = bring the yarn to the front and knit the next stitch. This will create a new stitch to be worked on the next row. Cast on 8 stitches using the two needle twisted cast-on method. Row 4: *k1 kfb*. Repeat from * to * to the end of the row (24 stitches). Divide the stitches over the 3 needles so that there are 8 stitches per needle. You can do this by just knitting 8 stitches on the next round and starting a new needle each time you reach the 9th stitch. To shape the heel we work on the first 12 stitches on the needle. The remaining 12 stitches are held in waiting until the heel has been turned. If your tension is loose you may like to put them on a couple of stitch holders until they're in play again. They will, in due course, be knit to form the instep, the front part of the sock opposite the heel. Now we’ll carry on and work the other side of the heel, picking up the wrapped stitches. Put to one side and work on the other sock. Do NOT cast off. If you would like to give your doll stripy tights, choose a contrasting colour and join it after you have turned the heel. 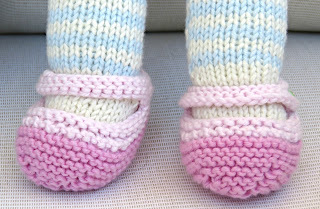 Knit 2 rows of your main colour, and then 2 rows of your contrasting colour all the way up the legs. Work a second foot and leg to match the first. We’re now going to join the 2 legs together with a gusset. 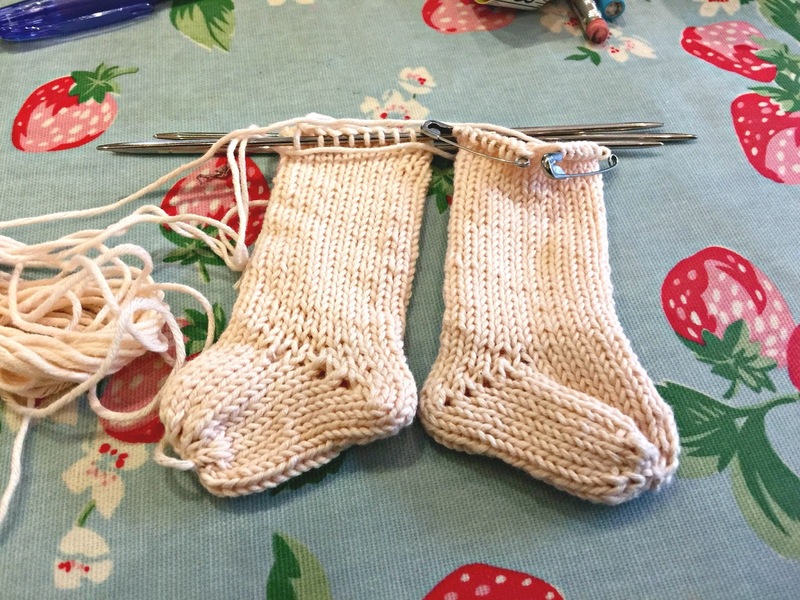 Place the feet side by side, and chose the central six stitches on opposite sides to knit up and across to form the gusset. Be careful that you chose stitches that are in the middle and will leave both feet pointing in the same direction. Join the knicker colour, which is the colour that we will use for the gusset, and knit 6 rows in stocking stitch. Leave the stitches on the needle and do the same on the other leg. Using the knicker colour join 2 sets of live stitches using a 3 needle bind-off. Keep the last stitch on the needle to start knitting around the body. Pick up 2 stitches on the other side of the gusset seam, and (still using the knicker colour) knit around the live stitches of the first leg to the other side of the gusset. Pick up 6 stitches across the other gusset section, and knit around the live stitches of the second leg back towards the gusset where the 3 needle bind-off terminated. Pick up 3 stitches on the first section of that part of the gusset. At the end of this row there will be 48 stitches on the needle, which we will carry on knitting to form the body. Row 3: *k7, kfb*. Repeat from * to * to the end of the row. You will have added 6 additional stitches and will finish the row with 54 stitches on the needles. Lightly stuff the legs and feet with toy stuffing. It’s a good idea to keep doing this as you work your way up the body as it will get increasingly difficult to stuff the extremities as the body is worked. Knit in stocking stitch until the knickers are 4.5 cm long, join the skin colour, and carry on working with it. Knit in stocking stitch until the body measures 9 cm. Row 1: *k1, k2 tog*. Repeat from * to * all the way round. This will reduce the number of stitches by 18 leaving 36 stitches on the needles. Rows 2 to 6: knit in stocking stitch. Row 7: *k2, k2 tog*. Repeat from * to * all the way round. This will reduce the number of stitches by 9 leaving 27 stitches on the needles. Rows 8 to 11: knit in stocking stitch. The neck has now been knit. Satisfy yourself that you are happy with the legs and feet stuffing and lightly stuff the body. 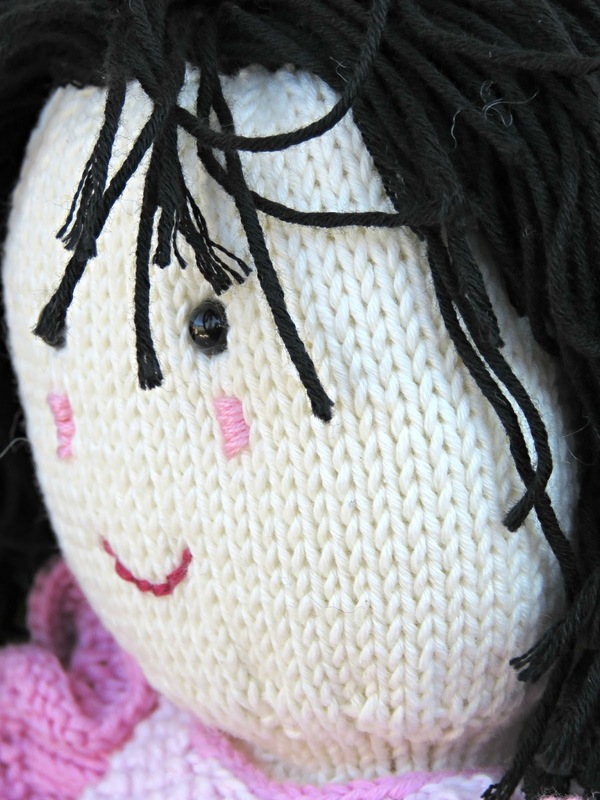 We are now going to increase the number of stitches to knit the doll’s head. Row 1: *k2, kfb*. Repeat from * to * all the way round. You will have added 9 stitches, increasing the number of stitches on the needles to 36. Row 2: *k2, kfb*. Repeat from * to * all the way round. You will have added 12 stitches, increasing the number of stitches on the needles to 48. Row 3: *k2, kfb*. Repeat from * to * all the way round. You will have added 16 stitches, increasing the number of stitches on the needles to 64. Knit 25 rows i.e. rows 4 to 28 in stocking stitch. Row: 29: *k2, k2 tog*. Repeat from * to * all the way round. You will have decreased the stitch-count by 16 stitches, leaving 48 stitches on the needles. Row 30: *k2, k2 tog*. Repeat from * to * all the way round. You will have decreased the stitch-count by 12 stitches, leaving 36 stitches on the needles. Row 31: *k2, k2 tog*. Repeat from * to * all the way round. You will have decreased the stitch-count by 9 stitches, leaving 27 stitches on the needles. Stuff the neck and lightly stuff the head, adding a felt circle of about 10 cm in diameter behind the part of the head that will form the face. The idea here is to have something a little firmer, that won’t fray, into which you can fix the safety eyes and anchor the embroidery as you sew on the facial features. Add the safety eyes, piercing the felt to hold them securely in place. Row 32: *k1, k2 tog*. Repeat from * to * all the way round. 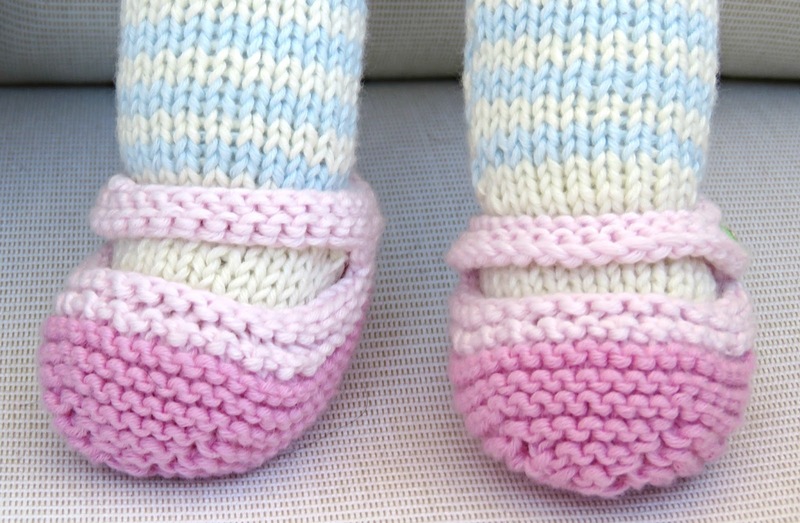 You will have decreased the stitch-count by 9 stitches, leaving 18 stitches on the needles. Row 33: *k1, k2 tog*. Repeat from * to * all the way round. You will have decreased the stitch-count by 6 stitches, leaving 12 stitches on the needles. Check that you are happy with the head stuffing. Add any final amounts of stuffing that you believe necessary. Cut the yarn and using a darning needle thread the yarn back through stitches on the needle to draw them tightly to a close. Secure the loose end and finish off. Work on the flat in stocking stitch for 10 rows. Row 11: cast off 2 stitches. Row 12: cast off 2 stitches. Carry on in stocking stitch until work measures 11 cm. Cast off, and sew around side seams. Stuff lightly and sew up top seam. Sew the arms to the body – at the side, and just below the neck. Add the hair using a crochet hook, looping it through the textile that forms the head and securing it with a loop knot. Once all the hair has been added you can trim it so that the doll has a haircut to your liking. Using embroidery thread, give the doll a smile and some rosy cheeks. Please bear in mind that the pattern given below is for the blue dress. At the end of the dress pattern you will find the patterns for the alternatives that have been used to knit the pink dress, namely how to do the slip-stitch stripes, the longer, frilly sleeves and the i-cord cast-on edging. Starting with the bottom hem of the skirt cast on 90 stitches in contrasting colour (CC). Distribute evenly across 3 needles i.e. 30 stitches per needle. Join with first stitch to make a circle without getting any twists. Rows 1 and 2 purl, or see alternative i-cord cast-on (set out at the end). Change colour to the main colour (MC), and work in knit stitch following the chart for the colour pattern. 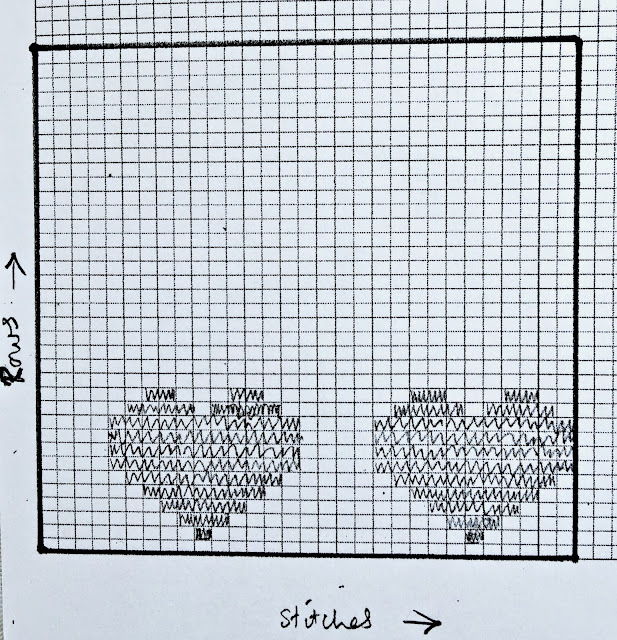 The stitch chart shows the pattern for the 30 stitches on each needle. Repeat the sequence for each needle as you knit around. Carry on in knit stitch until work measures 8 cm. Divide the stitches for the back and the front: place 30 stitches on one needle for the front, and another 30 on another needle for the back. From this point on we will work on the flat to shape the front and back independently of one another. Work 12 rows in purl stitch. Row 13: Cast off 4 stitches, and work to the end of the row in purl stitch (26 stitches). Row 14: Cast off 4 stitches, and work to the end of the row in purl stitch (22 stitches). Row 15: Reverse stocking stitch. Row 16: Cast off 1 stitch, and work to the end of the row in reverse stocking stitch (21 stitches). Row 17: Cast off 1 stitch, and work to the end of the row in purl stitch (20 stitches). Row 19: Cast off 1 stitch, and work to the end of the row in purl stitch (18 stitches). Row 20: k3, cast off 12 k2 (this will leave you with 3 stitches on either side of the 12 cast-off stitches). Work 3 rows in purl stitch on the right hand side shoulder of the 3-stitch row on that side. Cast off and rejoin the yard to work a similar 3 rows on the left hand side shoulder on the other side of the cast off stitches. Cast off and rejoin the yarn to knit the front. Join yarn and work 12 rows in reverse stocking stitch i.e. purl the right side (odd numbered) rows and knit the wrong side (even numbered) rows. Row 13: cast off 4 stitches, work to the end of the row in reverse stocking stitch (26 stitches). Row 14: cast off 4 stitches, work to the end of the row in reverse stocking stitch (22 stitches). Row 15: work in reverse stocking stitch. Row 16: Cast off 1, work to the end of the row in reverse stocking stitch (21 stitches). Row 17: Cast off 1, work to the end of the row in reverse stocking stitch (20 stitches). Row 18: Cast off 1, work to the end of the row in reverse stocking stitch (19 stitches). Row 19: Cast off 1, p5, cast off 6, p5 (leaves 6 stitches on either side of the 6 cast off stitches). Cast off, sew shoulder and side seams, darn in ends and block the dress. Pick up 24 stitches around the armhole. Join with first stitch to knit in the round. Work 6 rows in knit stitch. Work 2 rows in purl. Cast off and darn in the ends. This could be used as an alternative hem for the skirt. 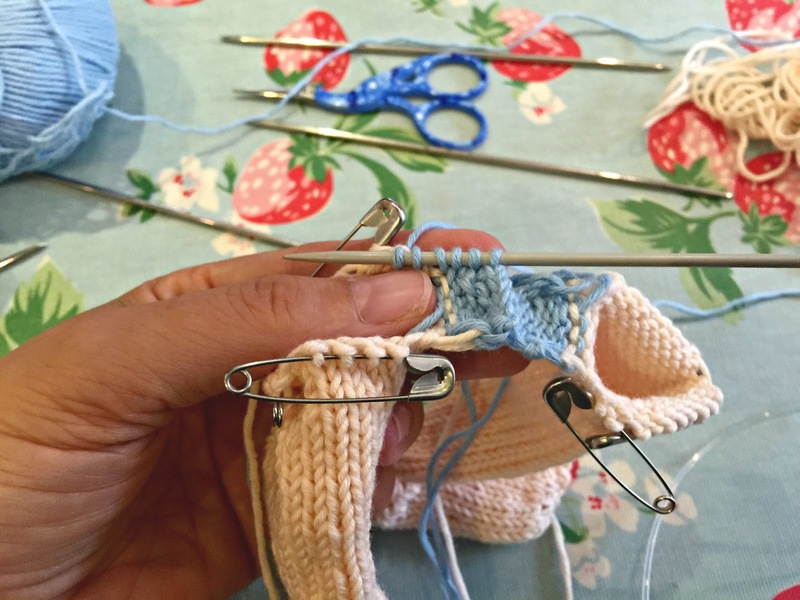 · Cast on 3 stitches using the long tail method using on pin needles or circular needles. · Slip the stitches back onto the left needle. 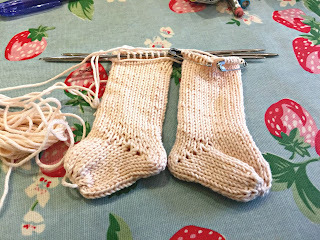 · You are going to knit them across onto the right needle again, pulling the live end of the yarn from the stitch on the extreme left, which was the last stitch to have been cast on and knitting into the front and back of the first stitch to create an extra stitch. · At the end of this first row, slip the last 3 stitches back onto the left needle and repeat. 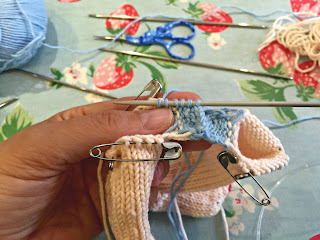 · Keep on going until you have the required number of stitches cast on plus one extra stitch. · Slip the last 2 stitches purl-wise back onto the right needle and then knit them together. This will give you the correct number of stitches and correct the bulk of the i-cord so that its two ends can be seamed when you’re finished knitting the project. If you don’t stitch the 2 ends together you’ll get a slight V-shaped gap in the finished article. · Join and close the circle by knitting the first stitch cast on with the live end of the yarn, and carry on knitting in the round. Be careful to pull the tension reasonably tight on the stitch that joins the round. · Carry on as normal with your pattern. 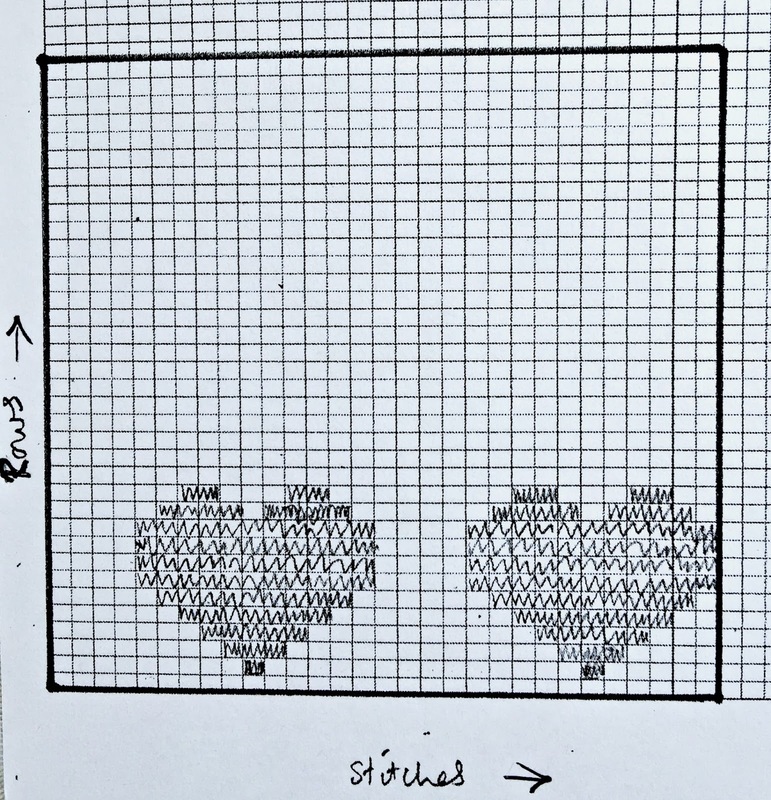 If you would like to do some colour-work but don’t want to follow a chart and create a picture pattern you may like to consider some vertical slipstitch stripes. This pattern can be worked over any even number of stitches. Carry on repeating rows 3 to 6 until your work is the required length. Work 9 rows in knit stitch. Row 14: Cast off and darn in the loose ends. On the pink dress a seed stitch bodice has been worked in place of reverse stocking stitch. This is worked in k1, p1 sequence. On the second row reverse the order taking care to knit on the purl stitches of the last row so that they are always out of sequence over any 2 successive rows. 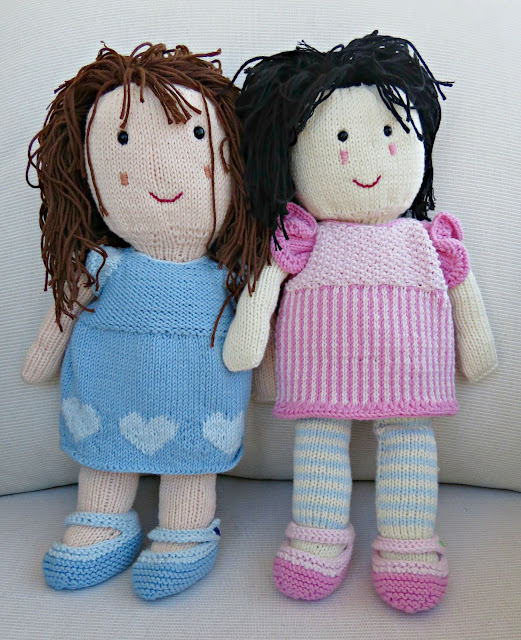 These are knit in two colours: the main colour (MC) and the contrast (CC) using 4 ply yarn and 2.75 mm (size 12) needles. Using MC cast on 29 stitches. Row 2: kbf, k to M, m1, k1, m1, M, k to last stitch, kbf. N.B. all the central stitch increases will be made between the two markers. Please keep the markers in place for this and the succeeding rows. The position of the markers will be shown as M for clarity. By the end of row 2 there will be 33 stitches on the needle. On row 9 remove the markers as you knit along the row. Row 14: change to CC and k.
Row 19: k7, Cast on 20 stitches using two-needle cast-on method to form the cross bar of the shoe to fasten it with. For now just leave the other 7 stitches on the other side of the 21 cast-off stitches un-worked. Row 21: k23, k2 tog, yfwd, k2. NB the k 2 tog, yfwd stitch combination creates the simplest buttonhole to button the shoe up with. Cast off remaining 7 stitches. Sew up the bottom seam and the back. Place a piece of felt where the button is to be sewed on, and sew the button in place to fasten the strap across the shoe. Darn in loose ends. Follow the same method as for the left shoe for rows 1 to 17. Row 18: k7, cast off 21, k7. Row 19: k 7 stitches on the live-yarn side of the 21 cast off stitches. Cast off 7 stitches, and rejoin yarn on the other side of the 21-stitch bind off at the side furthest away from the cast-off stitches. Row 19: (continued on other side of the bind-off with the right side facing) p 7, turn work so that the wrong side is facing and cast on 20 stitches (i.e. at the side adjacent to the cast-off stitches) using the two-needle cast-on method. Cast off and finish as for the left shoe.